On July 20, 1969, Neil Armstrong put the first human footprint on the moon. But when did animals leave the first footprint on Earth? Bilaterian animals such as arthropods and annelids have paired appendages and are among the most diverse animals today and in the geological past. They are often assumed to have appeared and radiated suddenly during the Cambrian Explosion about 541 to 510 million years ago, although it has long been suspected that their evolutionary ancestry was rooted in the Ediacaran Period. Until the current discovery, however, no fossil record of animal appendages had been found from the Ediacaran Period. 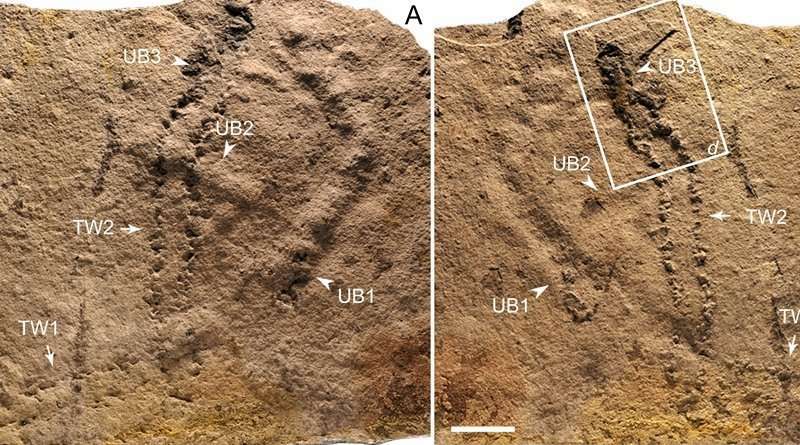 These trace fossils represent some of the earliest known evidence for animal appendages and extend the earliest trace fossil record of animals with appendages from the early Cambrian to the late Ediacaran Period. The body fossils of the animals that made these traces, however, have not yet been found. It is possible that such remains were never preserved.